It was decided to start by identifying the urban road system and in particular the two main axes of communication, one running from north-west to south-east and the other from west to east, both suggested by previous studies to have been developed in the first instance during the Iron Age. It can be seen on the magnetic map, and on the graphic representation of the features , that the main axes present clear evidence of what we have called ‘arterial roads’, corresponding to high-capacity urban road, in one case crossing the plateau from a gate at the north to another at the south, and in the other case from an access point at the west to another at the east. Likewise, it is easy to recognize a fairly regular pattern of linear features that start from the arterial roads and run for the most part in straight lines to cover most of the plateau with what have been designated as ‘collector roads’, moderate-capacity road which serves to connect arterial roads to different urban areas and providing access to public buildings and residential properties. In addition it has in places also been possible to identify features connecting two or more collector road, hence their classification as ‘sub-collector roads’, connecting collector roads and providing access to public buildings and residential properties. Overall, the Veii road system fairly closely reflects the physiography of the landscape. It also indicates the high level of sophistication in the layout of the city; this can be seen as the result of a long-term process of gradual development that nonetheless preserved a strong consistency across the long history of the urban center. From visual analysis of the features it seems possible to recognize a single basic pattern, which, in terms of its finer detail, probably developed gradually over a considerable length of time. Only a limited number of discontinuities within the general pattern have been detected up to now. A reasonable hypothesis is that the main axes took on their shape during a first occupation some time between the end of the late Bronze Age and the beginning of the Iron Age, the period when the first artifactual evidence is available. 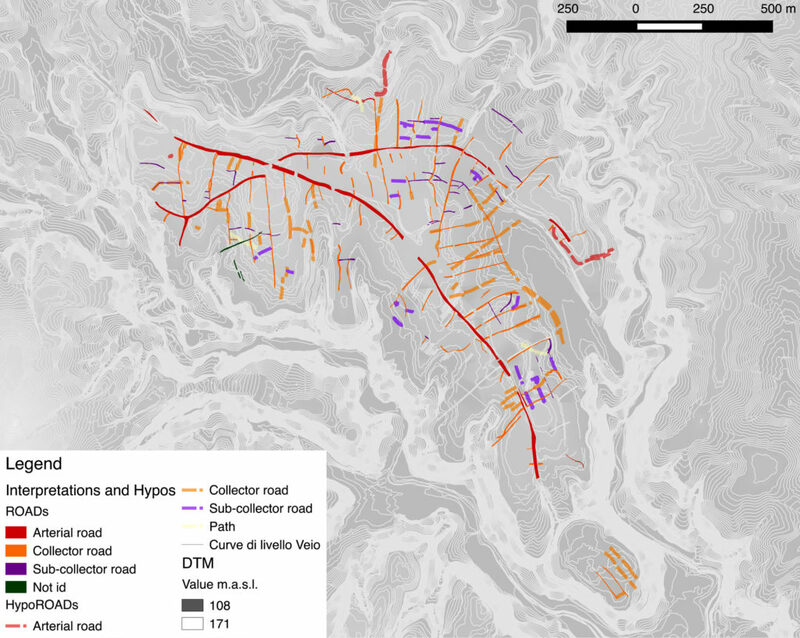 The overlay of the field-walking data and magnetic map makes it probable that by the end of the Archaic period the road system, including collector and even sub-collector roads, had already been fully developed. Indeed, we know from the early survey by the British School at Rome and from the more recent work on behalf of CNR that the greatest development of the city took place and the built-up area of the city reached its greatest extent in the Archaic period; artifact scatters from that time are present across the whole of the plateau. By contrast, after the conquest by Rome, during the late Republican and the Imperial Age the extent of the artifact scatters reduces substantially, in accord with historical sources and the excavation data. The magnetic data provide quite strong support for the view, developed from more traditional sources, of the city’s expansion and subsequent contraction over time. Indeed, there are vast areas of the plateau where no Roman material has been recovered from areas that correspond on the magnetic maps areas that display a pattern of collector roads and a dense distribution of buildings or other features. 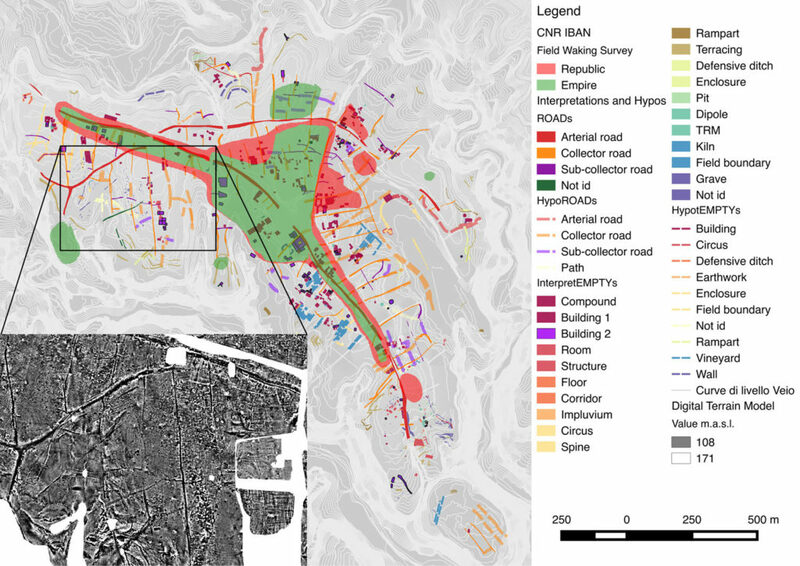 The consistency between the urban pattern revealed by geophysical prospection and the pottery distribution derived from field-walking survey leaves no room for doubt about this. Moreover, within seemingly built-up parts of the city it is possible to recognize in the magnetic data patterns of parallel ditches that can readily be attributed to the cultivation of vines. The distance between the rows varies, from one allotment to another, between 5m and 8 m, closely matching excavation evidence from around Rome that has been dated to the mid and late Republic. Another interesting point is the extraordinary longue durée of the road system. To better understand this point it might be useful to focus on what we know so far about the principal public buildings of the Roman period: the forum, theatre and thermal baths. None of these shows any consistent orientation with one another to form any kind of orthogonal or regular pattern. In fact all of them clearly adopt orientations based on the system of roads laid out during the Etruscan period. If from the one hand continuity represents an important archaeological data from the prospection point of view it represents a problem increasing significantly our capability to distinguish different period. 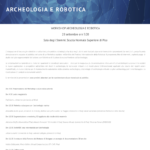 Among the first results of this present phase of the work, therefore, is the conclusion that almost the entire road layout of the largest and most important Etruscan city in Italy has been depicted through this application of geophysical prospection, in a way and with a clarity that has few if any parallels elsewhere in Italy. The closest comparable case is that of Vulci, where a fairly similar pattern is based on main axes curving across the plateau, supplemented by a system of radial collector roads. Another interesting parallel can be found in a slightly different geographical and cultural context, in southern Latium, at Gabii. 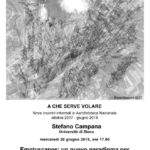 In both cases remote sensing data played a major role in allowing archaeologists to identify the overall pattern of the urban layout, in Vulci thorough aerial photography and in Gabii through large-scale magnetic prospection.